The Battle of Adwa, in which Ethiopian forces under Emperor Menelik II united to defeat an invading force of Italian troops, was one of the most significant turning points in the history of modern Africa. It occurred, in 1896, when the “colonial era” was well advanced on the African continent, and it served notice that Africa was not just there “for the taking” by European powers. More than this, it marked the entry of Ethiopia into the modern community of nations: Menelik’s victory over the Italians caused the other major European states, and Italy itself, to recognise Ethiopia as a sovereign, independent state in the context of modern statecraft. The actual battle which took place on March 1 and 2, 1896, at Adwa, the principal market town of the North of Ethiopia, had been precipitated by the great rush of the European powers to colonise Africa. Italy and Germany had lagged behind other European powers — most notably France and Britain — in seizing large parcels of the Continent to colonise. Thus, the Conference of Berlin was convened in 1884-85 to “divide up” the remainder of Africa among the other European powers, anxious to obtain their own African colonies to satisfy the urge for imperial expansion and economic gain. Italy was “awarded” Ethiopia; all that remained was for Italian troops to take possession. Significantly, until this time, Ethiopia had been left alone by the European powers. Its coastal littoral was well-known to traders, but the heartland in the highlands was peopled by nations notoriously unwilling to accept and embrace external contact and influence. But the Ethiopian nations had been known in the past to be fractious and divided, and from all accounts, Italy’s leaders expected a rapid conquest of the individual national leaders. Britain had, in 1868, waged a successful war against Emperor Téwodros II (Theodore), leading to his death. 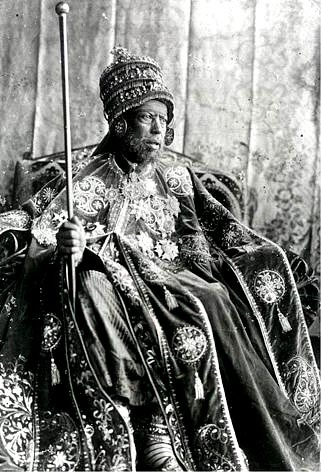 The Italians, however, failed to recognise that Emperor Menelik II had re-shaped Ethiopia since he came to power in 1889, uniting its various kings and leaders, and creating in the process a substantial army, outnumbering and outperforming the invading Italian professional army of 17,000 to 20,000 men. The modern parallel to the situation came with the Israeli-Egyptian confrontations of 1967 and 1973. The Israeli victory in 1967 (the Six-Day War) left Israel complacent and confident in the superiority of its forces over those of the Egyptians. Apart from this, the Israelis had put in place the Bar-Lev Line of fortifications, which were expected to hold against any conceivable Egyptian attack. But the Israeli leadership and intelligence services failed to note that the crushing defeat inflicted on Egypt so quickly in 1967 had brought about a dramatic transformation in the psyche of the Egyptian leadership. President Anwar as-Sadat totally transformed the education, training, equipment and doctrine of the Egyptian Armed Forces, without Soviet help (Soviet advisors had been expelled in 1972), within six years of the defeat. When Egypt initiated the October 1973 war, the transformed situation took Israel by complete surprise. Despite the massive logistical re-supply of Israel by the US — which effectively saved Israel from complete humiliation — and the recovery of initiative by Israeli commanders, Egypt achieved its strategic objectives. The Suez Canal was re-opened, the Sinai returned to Egypt, and peace achieved. With even less intelligence on which to base its actions, Italy could only draw on the British victory at Magdàla and the commonly held European belief that no African forces were a match for disciplined and well-equipped European military formations. But much had happened since Magdàla, and Emperor Téwodros’ defeat. Indeed, the British victory had even at that time obscured from General Robert Napier and his officers the sophistication of the system which they had just defeated. Victory often breeds contempt in the victors against the vanquished; at best it breeds an unwillingness to learn from the enemy so recently crushed. Apart from the overall political and social aspects of Ethiopia in 1868, Emperor Téwodros had based his defence against the British on the Rist-Gult system of recruitment, military structure and logistical support. This logistical structure was entrenched in what was commonly called Mesfint Hagr: namely, the present day highlands of Eritrea, the region of Tigré, Gonder, Gojjam, and Wello. The rest of Ethiopia was under a second type of resource system known as the Geber Madriya system, which formed the basis of the fiscal and military organisation of Emperor Menelik’s Government. One of the major failings of the Italian planners of Savoyard Italy was that they failed to notice the fundamental change in Ethiopia under Menelik. Emperor Menelik II had transformed the administration of the economy and had greatly improved the tax base of the country. This in turn improved dramatically his capability to raise armies and to equip them. The complex tax base meant that the battles fought during the era of the Rist-Gult system were precariously-managed affairs. As Tsegaye Tegenu noted: “It is not difficult to see the desperate effort of the kings to overcome the fiscal limits of the system to fight against external aggression.” And Menelik managed this transformation to a new economic base in such a way as to prepare Ethiopia for the most decisive battle. Emperor Menelik took immediate steps upon hearing of Italy’s plans to annexe Ethiopia. He called, on September 17, 1895, for national mobilisation, and within two months more than 100,000 troops were assembled in the specified areas: Addis Ababa, Were Illu, Ashenge, and Mekele. About two-thirds of these troops were raised through the Geber Madriya system. The Emperor himself mobilised some 35,000 troops, commanded by his court officials. His Queen — Empress Taitu — also mobilised her own force of some 6,000 men. The Imperial Army also included troops raised by governors-general, such as Ras Makonnen (the father of Ras Tafari Makonnen, later Emperor Haile Selassie I) who commanded some 12,000 troops. Dejazmatch Tesema commanded some 5,000 soldiers; Ras Welde Giorgis about 5,000; Ras Bitwoded Mengesha Atakim, about 6,000; and so on. Troops of the regional princes numbered about 35,000, and of these, Ras Mengesha of Tigré commanded about 8,000; King (Negus) Tekle Haimanot of Gojjam about 6,000; Ras Welle of Begémder another 6,000; Wagshum Guangul of Wag a further 5,000. 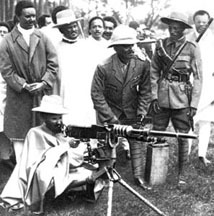 In all, Menelik was able to mobilise some 70,000 to 100,000 modern rifles for Adwa. By 1895, he had obtained at least 5,000,000 cartridges. He had spent more than $1-million (in 1895 currency), a sum which would have been unthinkable to Emperor Téwodros, or even Emperor Yohannes IV. And this sum did not even include the artillery which Emperor Menelik had secured. This component of the force — the Corps of Gunpowder and Shell — was commanded by a Bejirond: a treasurer in charge of finance and the storehouse of the Palace, and by the Lij Mekuas, who was also commander of the Royal cavalry. The logistical tail of the Adwa campaign, from the Ethiopian side, was no less impressive than the logistical effort put forth to carry and support the invading force of some 17,000 Italian troops from Europe, supplemented by local recruits. Italy had already occupied the highlands of Eritrea, and therefore was well-placed with forward support for the battle. Moreover, it was aware of the problems which had been challenging Ethiopia and Menelik. Famine and internecine squabbling were preoccupying the country, and Menelik was initially unable to mobilise forces to resist Italy’s occupation of Eritrea and its expansion into the hinterland. An emboldened Italy pushed further into Ethiopia, crossing the Mereb River and chasing out Ras Mengesha, the ruler of Tigré; full control of the region seemed at hand, and Italian forces settled in for a permanent occupation. Italian General Baraterie, commander of the occupation force and governor of the Eritrean colony, sought and obtained an additional budget of four-million lira and 10,000 more trained troops. But Gen. Baraterie seemed unaware of Menelik’s main strategic imperative, which was to wait for the opportunity to confront — with infantry and artillery — the main Italian force and its supplies, rather than engage in piecemeal battles at the enemy’s choosing. To this end, Menelik focused his efforts on building a large coalition force, capable of the mission. This entailed a process of diplomacy with the regional princes and rulers, not only to secure the participation of their individual armies, but also to be able to access their logistical support base. The strategy and tactics employed by Menelik were not only due to the Emperor’s diplomatic and military skills, but also to the unique doctrines developed by Ethiopia literally over several millennia. These doctrines were also created in virtual isolation from the military lessons learned by the rest of the world, and reflected Ethiopia’s own history and topography. In this sense, then, the Ethiopian forces under Menelik did not conform to the expectations of the Italians. As a result, the Battle of Adwa was to become a significant case study for military schools for the next century, and almost certainly well into the future. It would not be fair to say that the Italians had failed to study Ethiopian military history. But by basing their perspectives on the very different strategies of the Rist-Gult system used by Téwodros and Yohannes, they could not comprehend the vastly superior mobilisation capabilities of Menelik’s Geber Madriya system. Thus, when the Italians expected to meet a force of about 30,000 Ethiopians, they met instead some 100,000. Having said that, the Geber Madriya system was based on a form of recompense to the soldiers which involved grants of land and the payment of food, drink and honey, etc., to the soldiers from tenants working the land. In other words, it was a non-monetarised system which provided for the welfare of the troops. As a result, it was not a system which could be projected far beyond the supporting geography. The Battle of Adwa came in such a way that — because Emperor Menelik had lured the Italian main force into his own territory — it fitted perfectly the criteria of the Geber Madriya system. But Menelik, after the stupendous victory at Adwa, could not use the same structure to pursue the Italians into Eritrea and throw them entirely into the Red Sea. The result was that, although Ethiopia was, as an Empire, saved by the Battle of Adwa, the Italians remained lodged on the periphery. More importantly, the concept of seizing Ethiopia remained in the Italian psyche, so that when fascist Italy once more dreamed of empire in the 1930s, it again embarked upon an attempt to conquer Ethiopia. And, in that campaign, even though they met with initial success, it was once again an overreaching of Italian resources and Italy was thrown not only out of the Ethiopian heartland but also out of Eritrea. Thus, less than 50 years after Adwa, Eritrea, too, was restored to Ethiopia. Night During the night four brigades, totalling 17,700 men (10,600 Italian infantry and 7,100 Askari) and 56 guns, advance the nine kilometres from the Italian base camp at Sauria to a line of three defensive peaks overlooking the Ethiopian camp near Adowa. 2:30 The Italian commander, General Oreste Baratieri, and Brigadier General Giuseppe Ellena's reserve brigade halt near Mount Eshasho. 4:00 Brigadier General Giuseppe Arimondi's brigade (Italian infantry) halts its advance to allow Brigadier General Matteo Albertone's Native brigade (Askari) passage, the two brigades have become entangled in the dark and the unfamiliar terrain. 5:30 A Shoan horseman arrives at Adowa and informs Emperor Menelik II that The Ferangi (the foreigners) have been spotted north of Abba Garima. Menelik II, Empress Taitu, and the royal Shoan forces ride out to the church at Abba Garima to observe. 6:00 Albertone's brigade, now well in advance of the rest of the Italian army, encounters the Ethiopian right wing, commanded by Ras Tekla-Haymanot, which had been camped near to Edna Chidane Meret. 6:15 General Baratieri, based near Mount Eshasho with the reserve brigade, sends out runners to discover the location of Albertone's brigade. 7:45 Baratieri issues orders to Brigadier General Vittorio Dabormida to support the centre. Dabormida actually turns away and heads down the valley of Mariam Shavitu. Ras Makonnen and Ras Alula, joint commanders of the 30,000 strong Ethiopian left wing, take advantage of Dabormida's isolation. 8:15 Albertone sends a message back to Baratieri urgently requesting reinforcements. 8:30 Albertone's brigade begins to fragment. Baratieri observes battle smoke from the top of Mount Eshasho. 9:00 Menelik II has kept his 25,000 Shoan reserves back from the fight at Abba Garima. Empress Taitu seizes the initiative and encourages Menelik to release them by sending out her own bodyguard (3,000 infantry and 600 cavalry) into the fight. Albertone is overwhelmed and then taken prisoner. His remaining Askari attempt to flee back towards the camp at Sauria. 9:15 Baratieri finally receives Albertone's message and moves forward with reserve brigade. He observes the retreating Askari from Albertone's Native brigade running down the valley to the right of his position. Unfortunately he does not notice that Ethiopian troops are also amongst them. 10:00 Dabormida's brigade encounters the Ethiopian left wing in the narrow valley of Miriam Shavitu. Meanwhile the northern spur of Mount Bellah has fallen to the Ethiopian centre, commanded by Ras Mashanga and Ras Mikail: Arimondi's brigade crumbled when his left flank was stormed. Arimondi is killed in ensuring battle. 11:30 Baratieri, on the southern side of Mount Bellah, orders retreat. It almost immediately becomes a rout. 14:00 Dabormida realises his brigade is surrounded in the valley of Miriam Shavitu. He consults his brigade staff: "It is a serious thing, a serious thing. No message, nor order, no reinforcements – nothing." 15:00 Dabormida begins orderly retreat northwards. Late Afternoon Albertone's surviving Askari and remaining Italian soldiers from Baratieri and Arimondi's brigades retreat to Sauria and then to Adigat. Most don't stop until they reach the border. A telegram from Baratieri describing the armies defeat in Ethiopia is published by the Italian government. Baratieri is made a scapegoat and tried before a military court in Asmara. He is acquitted but considered unfit for command. The Battle of Adowa (also known as Adwa or sometimes by the Italian name Adua) was fought on March 1, 1896 between Ethiopia and Italy near the town of Adwa, Ethiopia in Tigray. It was the climactic battle of the First Italo-Abyssinian War. As the twentieth century approached, Africa had been carved up between the various European powers, with the exception of the tiny republic of Liberia on the west coast of the continent and the ancient, landlocked kingdom of Ethiopia, bordering the strategic Horn of Africa. Though Italy, a relative newcomer to the colonial scramble for Africa, was left with only two impoverished territories on the Horn: Eritrea and Somalia, it sought to increase its influence by conquering Ethiopia and creating a land bridge between its two territories. Italy and Ethiopia faced off in First Italo-Abyssinian War, with the two armies at a standoff in Tigray. By late February, 1896, supplies on both sides were running dangerously low. Succumbing to pressure from the Italian government, General Oreste Baratieri made the first move on the night of February 29. He did not calculate the rough terrain, however, and his army was divided into small pockets of troops without contact with each other. This was observed by the Ethiopian commander Ras Makonnen (father of Emperor Haile Selassie), who ordered his troops to attack. By morning, troops belonging to Emperor Menelik II and Empress Taitu joined the forays. The Italians were heavily outnumbered by the Ethiopians by about 14,500 to as much as 100,000, and the Italian army was encircled and routed. Further casualties ensued during heavy skirmishing as the Italians retreated to their bases. The Italians took 11,000 casualties, while the Ethiopians had about 10,000. As a direct result of the battle, Italy signed the Treaty of Addis Ababa, recognizing Ethiopia as independent state. Responsibility for the fiasco fell on Baratieri, and he was relieved of his command. The humiliation remained with Italy for almost forty years, until 1935, when Benito Mussolini again tried to take Ethiopia. On the other hand, the defeat of a colonial power and ensuing recognition of African sovereignty were rallying points for later African nationalists during the struggle for decolonization. "In matters of foreign policy we have been ever guided by three basic principles. First is our deep conviction that, where there is no lack of goodwill, all international disputes can be resolved through negotiations, without recourse to violence. An inevitable corollary of this belief is our firm conviction that all nations, whatever their political persuasions, can live together in peace. Second is our unswerving devotion to the principle of collective security. Third, flowing from the principle of collective security, is the necessity, in these anxious days when the major powers are engaged in a frantic arms race, for all countries which have accepted this principle and assumed a share of the responsibility for ensuring the peace of the world, to become ever stronger militarily." "What the economically backward countries are looking forward to, however is the application of the money now dumped on destructive armament to the solution of economic problems." There are three reasons why we commonly refer to some happening as a historic event: either it occurs for the first time; it has significant consequences; or it is symbolically important. As a first time event, Emperor Menelik’s cession of the Bogos highlands to Italy in 1889 has been described as historic, as the first time that an Ethiopian ruler ever voluntarily ceded territory to a foreign power. In the same vein, Abebe Bikila’s victory in the marathon race in the 1960 Olympics at Rome was historic, as the first time that an Ethiopian won a gold medal. We also designate events as historic when their consequences significantly alter the shape of subsequent history. The conversion of King Ezanas to Christianity in the middle of the fourth century was historic in this sense because it redirected Ethiopia’s entire cultural development. Similarly, the protection given to disciples of the Prophet Mohammed by the Ethiopian king in the seventh century was a historic event. It led Mohammed to advise his followers to spare Ethiopia from the jihad of Islamic expansion that took place soon after. Likewise, the killing of Emperor Yohannes IV by Sudanese Mahdists in 1889 was historic because it opened the way to the ascendancy of an emperor from Shoa. Even when events have no significant direct consequences, we tend to call them historic when they symbolize important national or universal human ideals. The suicide of Emperor Tewodros II had little political consequence, his rule was over, whether or not he was captured alive by the British but it came to symbolize a sentiment of preferring death over demeaning captivity. The speech of Emperor Haile Selassie to the League of Nations in 1937 is often called a historic address, even though it did nothing to change the course of history, because it came to symbolize the moral weakness of Western democracies in the face of fascist expansionism and the need for a stronger world organization empowered to provide collective security. The Battle of Adwa in 1896 qualifies as an historic event in all three senses of the term. As a historic first, it represented the first time since the beginning of European imperial expansion that a non-white nation had defeated a European power. The Battle of Adwa in 1896 also had two fateful consequences the preservation of Ethiopia’s independence from Italian colonization, and the confirmation of Italy’s control over the part of the country Italy had named Eritrea in 1890. Both consequences had repercussions throughout the twentieth century. Italy experienced her defeat at Adwa as intensely humiliating, and that humiliation became a national trauma which demagogic leaders strove to avenge. It also played no little part in motivating Italy’s revanchist adventure in 1935. On the other hand, Italy’s continued occupation of Eritrea gave her a convenient springboard from which to launch that invasion. A generation later, tensions stemming from the protracted division of historic Ethiopia into two parts one under European governance, one under the Ethiopian Crown culminated in a long civil war, and the eventual secession of Eritrea as an independent state in 1993. In addition to these actual historic consequences, the Battle of Adwa was historic because it acquired symbolic significance of many kinds. In some instances this symbolism itself came to exert a certain influence on the course of events. Adwa’s Symbolism in Other Countries In Europe: The short-term symbolic significance of the Ethiopian defeat of Italy in 1896 was that it served to initiate a process of rethinking the Europeans’ image of Africa and Africans. During the nineteenth century Africa had come to be viewed in increasingly pejorative terms, as a continent of people so primitive they were fit only for European rule. Ethiopia did not escape such swipes. British officers called Ethiopia a nation of savages and Italian officials described it as a nation of primitive tribesmen led by a barbarian. The British Foreign Office supported the provocative move of ceding Zula to Italy, expecting that Yohannes would protest by attacking them and then easily be punished for imagining that Ethiopians were equal to white men. Kaiser Wilhelm responded to Emperor Menelik’s announcement of his accession to the throne with insulting language. The stunning victory at Adwa required Europeans to take Ethiopia and Africa more seriously. It not only initiated a decade of negotiations with European powers in which nine border treaties were signed, it made Europeans begin to reconsider their prejudices against Africans. It came to symbolize a rising awareness among Europeans of African political resources and yearnings and an increasing recognition of indigenous African cultural accomplishments. 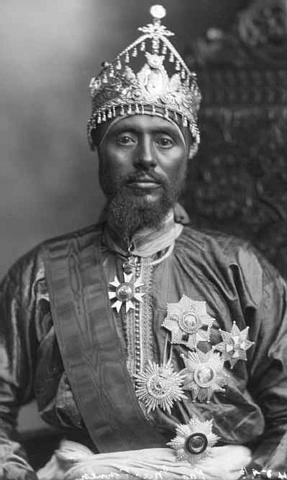 With respect to Menelik’s reputation, it partly overcame the resentments he had stirred up by ceding Bogos to Italy in exchange for help against his competitors in Tigray. As a historic assertion of Ethiopia’s independence, Adwa also reverberated with memories of Ethiopia’s experience as a long-lived independent polity. Its symbolism thereby encompassed a layer of meaning that alluded to the historic depth of the Ethiopian nation. It revived memories of earlier achievements and yearnings. At the same time, Adwa may have served to give Ethiopians a false sense of confidence about their position in the modern world. In showing themselves and the world that they could defeat a European invader with their own resources, the 1896 campaign may have led them to think that their traditional resources could be adequate in an era in which war would be waged with tanks and airplanes. It gave encouragement to isolationist and conservative strains that were deeply rooted in Ethiopian culture, strengthening the hand of those who would strive to keep Ethiopia from adopting techniques imported from the modern West"resistances with which both Menelik and Ras Teferi/Haile Selassie would have to contend. Adwa as a Symbol of Multi-ethnic Cooperation: The symbolism of multi-ethnic collaboration evoked by the Battle of Adwa has been less visible than its role in symbolizing Ethiopia’s tradition of independence. Yet in some ways the former was the most remarkable and meaningful aspect of the entire episode. Although members of different ethnic, religious, and regional groups had been interacting regularly in Ethiopia for more than 2,000 years"through trading, intermarriage, common ritual observances, pilgrimages, and political competition"from the perspective of Ethiopian history, Adwa offers the most dramatic instance of multi-ethnic collaboration before the 20th century. This is because it gave expression to a great outpouring of national patriotism, foreshadowing the great patriotic struggles of 1935-41. Even from the perspective of modern world history, Adwa represented a relatively rare struggle for national independence waged by a coalition of diverse ethnic groups. Twenty-five years earlier, Adwa had been the scene of a protracted battle between Dejazmatch Kasa, who would become Emperor Yohannes IV, and the reigning emperor, Tekle Giorgis II, formerly Wag Shum Gobeze. What the 1871 Battle of Adwa symbolized was the age-old struggle among different regional and ethnic groups for dominance. Yohannes, like Tewodros II before him, came to the throne determined to reunify the empire, which had been fragmented following the invasion of Ahmed Gragn and subsequent divisive developments. Although Yohannes did not live to see it, the 1896 Battle of Adwa was a tribute to his vision and to the thoughtfulness and determination with which he sought to unify Ethiopia while respecting the local jurisdiction of regional kings and lords so long as they remained faithful to the national crown. Those who would deny Ethiopia’s long existence as a multi-ethnic society must be embarrassed by the facts of the Adwa experience. If the empire consisted of nothing but a congeries of separate tribal and regional groups, how then account for the courageous collaboration of 100,000 troops from dozens of ethnic groups from all parts of the country? How then explain the spirited national patriotism of such diverse leaders as Ras Alula, Ras Mengesha, and Ras Sibhat of Tigray, Dejazmatch Bahta of Akale Guzae, Wag Shum Guangul of Lasta, Ras Mikael of Wollo, Negus Tekle-Haymanot of Gojjam, Ras Gobena and Dejazmatch Balcha of the Mecha Oromo, Ras Wole of the Yejju Oromo, Fitawrari Tekle of Wollega, Ras Mekonnen of Harer, as well as Ras Gebeyehu (who died fighting at Adwa) and Ras Abate of Shoa? Of course, deeply rooted antagonisms and persistent rivalries among different factions beset Ethiopia throughout the 19th century. And yet, as historian Sven Rubenson has written, "at the crucial moment, Menelik commanded the loyalty of every important chief in the country." The Battle of Adwa became and remains the most outstanding symbols of what, a half-century later, a British colonel would describe as the "mysterious magnetism" that holds Ethiopia together. The Peter B. Ritzman Professor of Sociology at the University of Chicago.